its no secret that i love brunch. it is my favourite meal of the day … by far. i am also a sucker for middle eastern eggs, and haloumi cheese – so when a cafe offers both in one meal i’m sold! enter gas eatery in south melbourne. this small cafe is cosy and homey with a couple of large tall bench seats and a bar against the window – affording the keen people-watcher a front row seat of all the market-goers. while the service can sometimes be slow going (it seems extra-long when you’re waiting for that first coffee of the day! ), the food never disappoints. i’ve had this dish countless times now, and each time it is perfect. definitely one of my favourites. 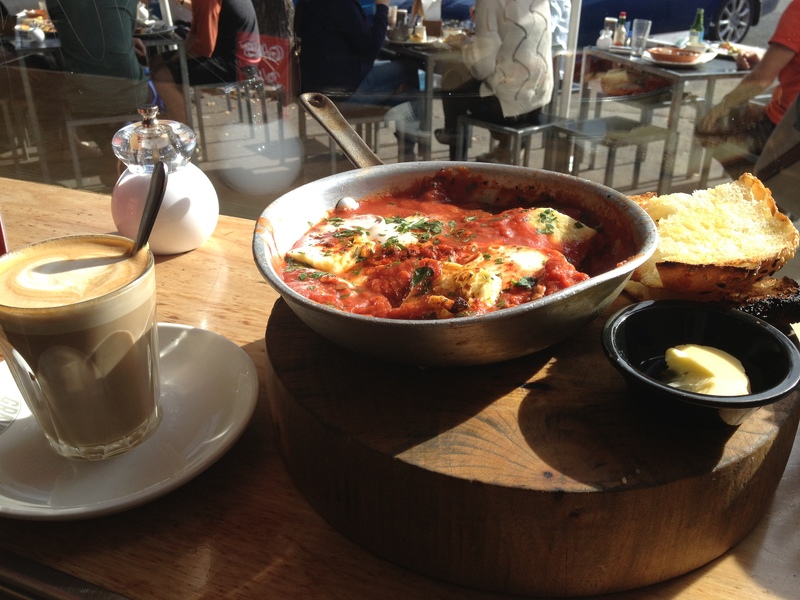 middle eastern eggs served in an iron pan with spiced stewed tomato sauce, grilled haloumi cheese and paprika. accompanied with toasted turkish bread.